BRAND NEW APARTMENT IN THE CITY CENTRE offered for long-term rent by owner. 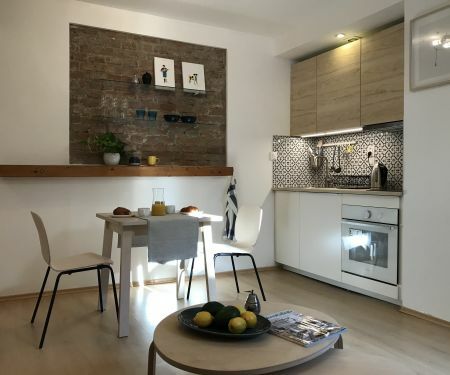 Completely furnished double-room flat (45 m2) including cellar (3 m2) is situated on the fourth floor of a modern, newly built apartment building in the city center just opposite the Presidential Palace. The apartment is oriented to the east and has great disposition – hall with a large wardrobe, bathroom (with automatic laundry washer) with toilet, impassable living room with a kitchen (including a bar and a dining table) and impassable bedroom with a double bed and wardrobe. The apartment is luxuriously equipped with high quality furniture. The kitchen in high gloss is equipped with BOSCH (fridge and freezer), FRANKE (glass-ceramic hob, dishwasher and hot air oven) and BLANCO appliances (wash-bowl with water battery and sorter) and a design fume hood. Majitel byva v Bratislave a zabezpeci aby ste mali k dispozicii vsetko co potrebujete k pohodlnemu byvaniu. 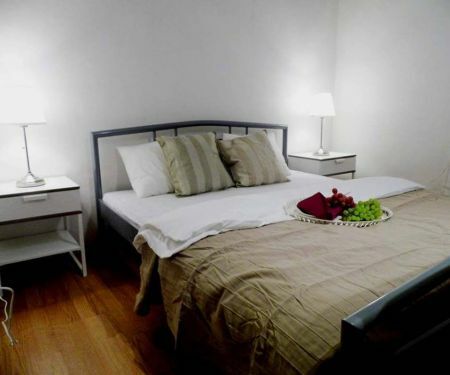 The owner lives in Bratislava and will arrange everything what you need for comfortable living.